Severe acute respiratory syndrome (SARS) is a febrile respiratory illness. The disease has been etiologically linked to a novel coronavirus that has been named the SARS-associated coronavirus (SARS-CoV), whose genome was recently sequenced. Since it is a member of the Coronaviridae, its spike protein (S2) is believed to play a central role in viral entry by facilitating fusion between the viral and host cell membranes. The protein responsible for viral-induced membrane fusion of HIV-1 (gp41) differs in length, and has no sequence homology with S2. Sequence analysis reveals that the two viral proteins share the sequence motifs that construct their active conformation. These include (1) an N-terminal leucine/isoleucine zipper-like sequence, and (2) a C-terminal heptad repeat located upstream of (3) an aromatic residue-rich region juxtaposed to the (4) transmembrane segment. This study points to a similar mode of action for the two viral proteins, suggesting that anti-viral strategy that targets the viral-induced membrane fusion step can be adopted from HIV-1 to SARS-CoV. Recently the FDA approved Enfuvirtide, a synthetic peptide corresponding to the C-terminal heptad repeat of HIV-1 gp41, as an anti-AIDS agent. Enfuvirtide and C34, another anti HIV-1 peptide, exert their inhibitory activity by binding to a leucine/isoleucine zipper-like sequence in gp41, thus inhibiting a conformational change of gp41 required for its activation. We suggest that peptides corresponding to the C-terminal heptad repeat of the S2 protein may serve as inhibitors for SARS-CoV entry. Infection by many enveloped viruses requires fusion of the viral and cellular membranes. A viral envelope protein mediates this membrane fusion process. These proteins are synthesized as precursors (ENV in Retroviridae, and E2 in Coronaviridae) that are later processed into a transmembrane subunit (gp41 in the retrovirus HIV-1, and S2 in the coronavirus SARS-CoV) that is responsible for viral-induced membrane fusion, and a surface subunit that is responsible for the interaction with the cellular receptor/s. HIV-1 gp41, which is a well-characterized protein [1, 2] contains two heptad repeat (HR) regions, a leucine/isoleucine HR adjacent to its N-terminus (N-HR), and C-HR proximal to the transmembrane domain (see Figure 1). Heptad repeats are characterized by hydrophobic amino acids in the "a" and "d" positions of the helix. In the N-HR of gp41, all but one of the "a" positions are Leucines or Isoleucines. This feature is less strict in the "d" positions of N-HR, and in the "a" and "d" positions of the C-HR. Peptides corresponding to these heptad repeat regions form the "trimer-of-hairpins" core structure of gp41  as confirmed by the solution of the crystal structures [1, 2]. Two Cysteine residues and one Proline residue, located between these two HRs, confine a hairpin conformation (Figure 2a). A tryptophan-rich motif, located between the C-HR and the transmembrane domain, was shown to play a crucial role in gp41-mediated membrane fusion  (Figure 2a). Wheel projection of the N-HR (a) and C-HR (b) of HIV-1 gp41 (gi|9629363). The amino acid sequence is displayed end-to-end down the axis of a schematic helix. The angle between every two consecutive amino acids is 102.9°. The helical wheel consists of seven corners, corresponding to the fit of seven amino acid residues into every two helical turns. Similarity between the fusion proteins of HIV-1 and SARS-CoV. The HIV-1 gp41 (a) and the equivalent S2 protein from the SARS-CoV (b) are shown. A Leucine/Isoleucine heptad repeat adjacent to the N-terminus of both proteins appears in red. The C-terminal heptad repeat is in green. Cysteine residues (purple) confining a loop structure are located between the two heptad repeats. An aromatic residues-rich motif is marked blue, and the transmembrane segment is in orange. A peptide corresponding to the C-terminal heptad repeat, which acts as potent inhibitor of HIV-1 entry into the cell, appears in yellow. In order to exert their role in membrane fusion, viral spike proteins act as oligomers and go through a significant conformational change resulting in the "trimer-of-hairpin" conformation. The oligomerization and the change in conformation of viral spike proteins involve interactions between proteins segments. Peptides derived from a segment of this protein might therefore interfere with one of these processes, and inhibit viral infection. Indeed, peptides corresponding to the C-HR of gp41 are potent inhibitors of HIV-1 entry into cells, one of them, Enfuvirtide (Fuzeon), was recently approved by the FDA as an addition to the cocktail currently given to AIDS patients , and C34, a peptide corresponding to the C-HR of the gp41 core complex is promising in-vitro . It is believed that these peptides exert their anti-viral activity via a dominant negative mechanism by interacting with the central N-HR segment of gp41 . This is a promising approach also in developing anti-viral peptides against several paramyxoviruses . The genome of the SARS-CoV was recently sequenced [8, 9]. Since it is a member of the Coronaviridae , the S2 protein is believed to play a central role in viral entry. Although we found no sequence homology between the SARS-CoV S2 and HIV-1 gp41, a comprehensive sequence analysis reveals that all the above-mentioned elements of gp41 are present also in S2. In analogy to HIV-1 gp41, N-HR and an aromatic-rich region in SARS-CoV S2 protein were identified by Gallaher & Garry . Whereas these discoveries have structural importance, peptides corresponding to the N-HR of HIV-1  and Sendai virus , and to the aromatic-rich region of feline immunodeficiency virus  were found to have only low anti-viral activity, compared to the highly active C-HR corresponding peptides. Herein, we report the identification of the sequence in SARS-CoV S2 protein that is analogous to the C-HR of HIV-1 gp41. This led us to the suggestion that the viral entry mechanisms are analogous and therefore a therapeutic strategy that is being applied against the HIV-1 can be adopted to fight SARS-CoV. Coronaviridae S2 proteins are believed to be functionally equivalent to the transmembrane subunits of Retroviral ENV. However, using well-known sequence comparison algorithms [15, 16], we found that there is no sequence homology between the S2 protein of SARS-CoV and HIV-1 gp41. 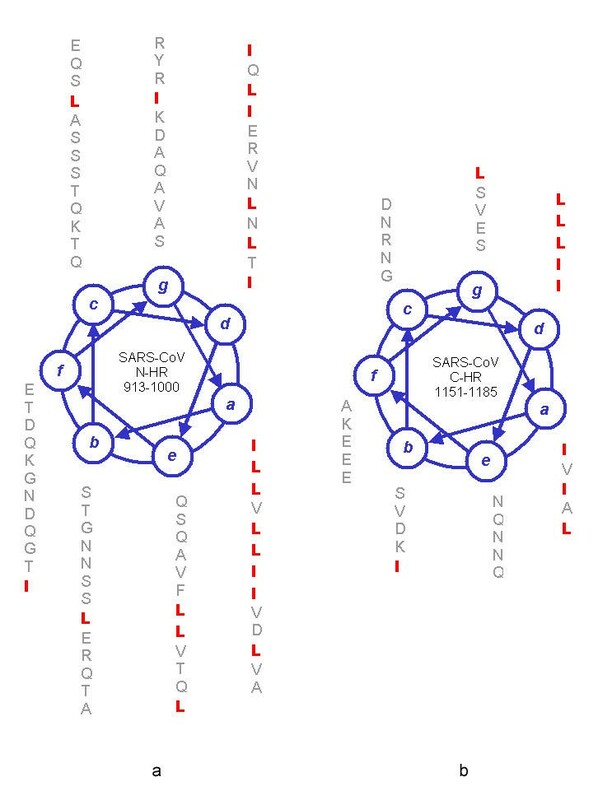 Markedly, LearnCoil-VMF , helical wheel analysis and protein topology prediction  reveal that the SARS-CoV S2 protein consists of the same elements that were characterized in HIV-1 gp41 (Figure 2b): (I) N-HR, a Leucine/Isoleucine heptad repeat appears on residues 913–1000 of the SARS-CoV CUHK-W1 isolate (Figure 3a). ; (II) C-HR, a Leucine/Isoleucine heptad repeat appears on residues 1151–1185 (Figure 3b); (III) the loop between these two HRs is longer than that of gp41, and is confined by four Cysteine residues and nine Proline residues that might conform a double loop structure; (IV) a transmembrane region is predicted adjacent to the C-terminus of the protein ; (V) a Tryptophan/Tyrosine-rich motif is located between the C-HR and the transmembrane domain (Figure 4). 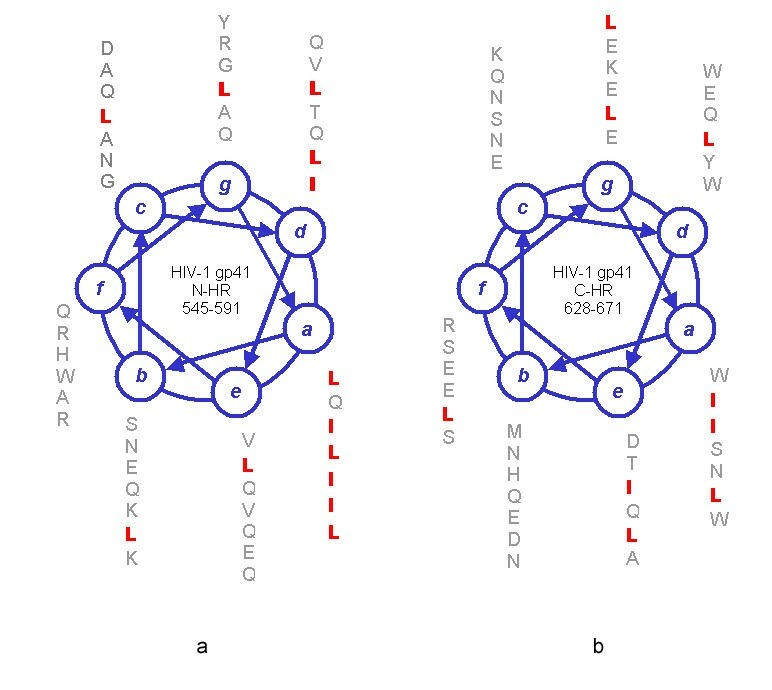 The results reveal similar structural motifs in HIV-1 gp41 and SARS-CoV S2 proteins, suggesting an analogous membrane fusion mechanism induced by the two viruses. Wheel projection of the N-HR (a) and C-HR (b) of SARS-CoV S2 protein (gi|30023954). The amino acid sequence is displayed end-to-end down the axis of a schematic helix. The angle between every two consecutive amino acids is 102.9°. The helical wheel consists of seven corners, corresponding to the fit of seven amino acid residues into every two helical turns. Sequence comparison of the aromatic residue-rich regions of HIV-1 gp41 and SARS-CoV S2 proteins. The aromatic residues are in blue. Remarkably, the relatively rare aromatic residues comprise about half of the residues in these region. The helical wheel diagram serves as an equivalent to the Spartan scytale, the first military cryptographic device, consisting of a cylinder with a strip of paper wound around it. The recipient has a rod of the same diameter, on which he wraps the paper to read the message. Herein, the prior knowledge of the 3.5 periodicity learned from the HIV-1 gp41 structural studies, is used to decipher the structural features of the SARS-CoV S2 protein. In general, SARS-CoV S2 and HIV-1 gp41 share the hairpin structure. However, it is worth noting that the N-HR of S2 is longer than that of gp41 and contains more Leucines and Isoleucines. Furthermore, while the C-HR of gp41 barely shows any heptad repeat signal, the C-HR of S2 has a perfect Leucine/Isoleucine heptad repeat in its "d" positions. The antiviral activity of Enfuvirtide was reported as early as 1993 , while it took few years until the fold of gp41 core complex was discovered  and its crystal structure being solved [1, 2]. Based on these structural studies, peptides corresponding to the C-HR of gp41 core complex, such as C34, were synthesized and found to efficiently inhibit HIV-1 induced membrane fusion . Interestingly, Enfuvirtide, which is a shifted version of these C-peptides, does not comprise the residues that were shown to be essential for their inhibitory activity . Indeed, others and myself reported that in some cases C34 is more potent in inhibiting HIV-1 gp41 induced membrane fusion than Enfuvirtide [21, 22]. Thus, the SARS-CoV sequence corresponding to C34 has higher chances to block SARS-CoV entry. Based on the similarity in the mechanisms in which the two viruses induce fusion between their membrane and their host cell membrane, we propose adapting the successful anti-fusion therapeutic approach used against HIV-1 to the SARS-CoV case. Peptides derived from the C-HR segment of SARS-CoV S2 protein (ISGINASVVNIQKEIDRLNEVAKNLNESLIDLQEL) might inhibit viral induced membrane fusion, thereby blocking SARS-CoV infection. As the SARS-CoV infects respiratory tissues, the classical disadvantages of peptide therapeutics administration may be overcome using intranasal delivery . LearnCoil-VMF program  and helical wheel diagrams, with 3.5 amino acid per residue, were used to detect coiled-coil regions in the SARS-CoV S2 protein. HMMTOP program  was used to predict the location of transmembrane regions in the SARS-CoV S2 protein. SARS-CoV genomic sequence information (NC_004718) was retrieved from GenBank at the National Center for Biotechnology Information (NCBI). The SARS-CoV E2 precursor protein accession number is gi|30023954. This precursor is believed to be post-translationally processed to reveal S1 and S2, as confirmed in other Coronaviridae viruses. The HIV-1 gp160 precursor protein sequence used here is gi|9629363. Gp41 starts at residue 512, after the basic cleavage site. Severe Acute Respiratory Syndrome Coronaviridae Virus. US Food & Drug Administration. We thank Eli Eisenberg, Salomon Langer, Rodrigo Yelin, Moshe Olshansky and Rotem Sorek for helpful discussions. We are also grateful to Amit Rubinfeld for technical help. Y.K. was responsible for the initiation of this project. E.Y.L. & Y.K. carried out the technical work, analyzed the data, drafted the manuscript and approved the final manuscript.